Last year I added a pair of electric sissors to my Christmas list. I thought if I ever started any real 'sewing' (you know, versus the pretend) they would come in handy. Beau bought me a pair online that he claims he even researched and they had good reviews. The did a real good job cutting paper; but anything more than 1 layer of lightweight fabric, was out of the question. I decided to keep them, however, as I do periodically go off on paper cutting spells. Sometime, earlier in the year, I brought home a big box of fabrics. Stuck down in the box was a pair of electric sissors. Although I didn't check to see if they worked, I tucked them away in a cabinet. The other day, I was processing patterns for the Todays Treasure shop and I came across New Look 6720 and thought I'd make myself a pair of these wonderfully comfortable looking shorts. I selected a piece of maroon, lightly pattern fabric from the cabinet and then, remembered I had the electric sissors. Out they came. Now, these sissors are quite old, evidenced by the lack of a polarized plug. 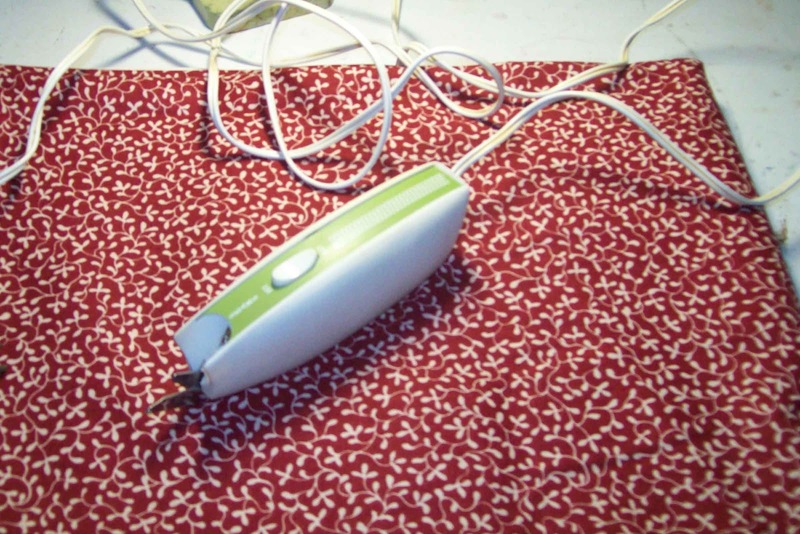 I cut out and pinned down the pattern and plugged in the sissors. With great anticipation, I pressed the 'Geaux' button. I remember in my early teenage years, Mother had a pair just like these, except they were pink; and I was never allowed to use them. When she had the time, she loved to sew. She layed the fabric out, and it seemed, just when I was watching something really great on TV, she'd turn them on and the loud HUMMMMMMMM, accompanied the the vibration from the tabletop, would drown out everything. Well, maybe it's a slight exaggeration, but, they were loud. Just like these. And, not only did they make that vibrating I sound I recalled, I could feel the vibration in my hands. And, do they cut ? Why yes, they do. Wonderfully. The only deficiency I can find is the light doesn't turn. I'll have to see if these tiny bulbs are still available. I image someone became to old to sew, or perhaps past on, and their loved fabrics were put into a yard sale. Perhaps they were sad; perhaps they didn't care. But either, whoever you are, I love these sissors and promise to put them to good use.